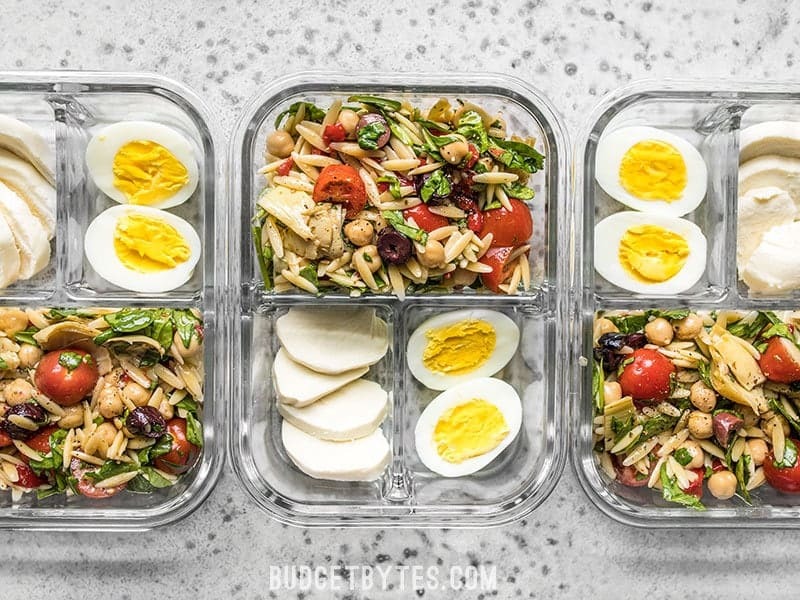 The glass meal prep containers shown in the photos can be found here, and all my other meal prep containers can be found here. As an Amazon Associate I earn from qualifying purchases. Place your eggs in a sauce pot and add enough water to cover the eggs by one inch. Bring the pot up to a boil over high heat. Once it reaches a full boil, turn the heat off, place a lid on the pot, and let the eggs sit for 15 minutes. (15 minutes is the appropriate time for LARGE sized eggs. Larger or smaller eggs will need more or less time. After 15 minutes, transfer the eggs to an ice water bath and let them cool in the ice water for 15 minutes. For step by step photos of this process, check out my Sriracha Deviled Eggs recipe post. Hard boiled eggs stay the freshest in their shell, but I peeled and sliced mine open for the photographs. 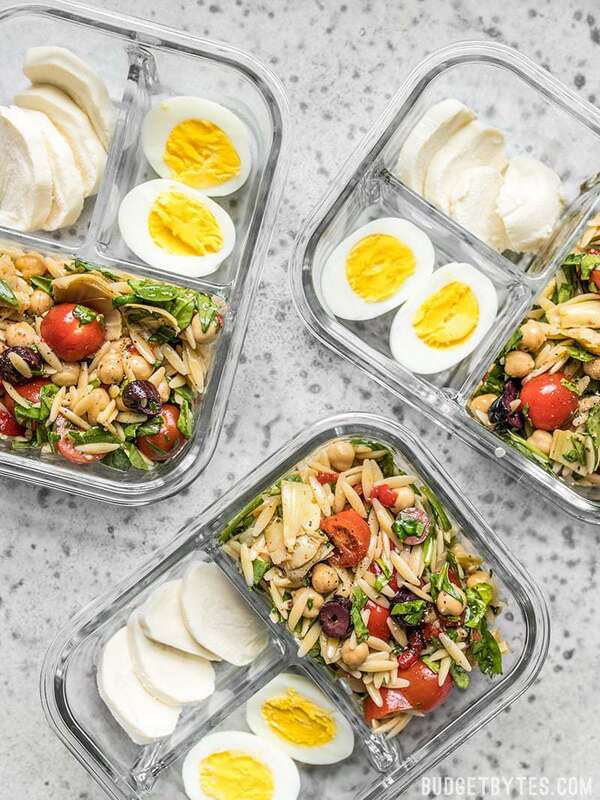 This salad would go with several other side items, like: salami or pepperoni, grilled or rotisserie chicken, cubed cheddar cheese, crackers, garlic bread, sliced bell peppers, or dried apricots. I found this salad to hold up surprisingly well, even after the dressing was added, but if you want extra protection against wilting, pack the dressing separately and add it just before serving. Do you just leave the egg in shell and freeze? Perfect office lunch ! Thank you ! Doesn’t the fresh mozzarella get kind of hard and yucky after being out of water for more than a day? Mine held up fine. :) The kind I bought was actually packed as a log in vacuumed plastic with just a little liquid, so it wasn’t really in water to begin with (it was from Aldi), but it held up in the boxes. You could always do regular mozz, instead. This looks so good! 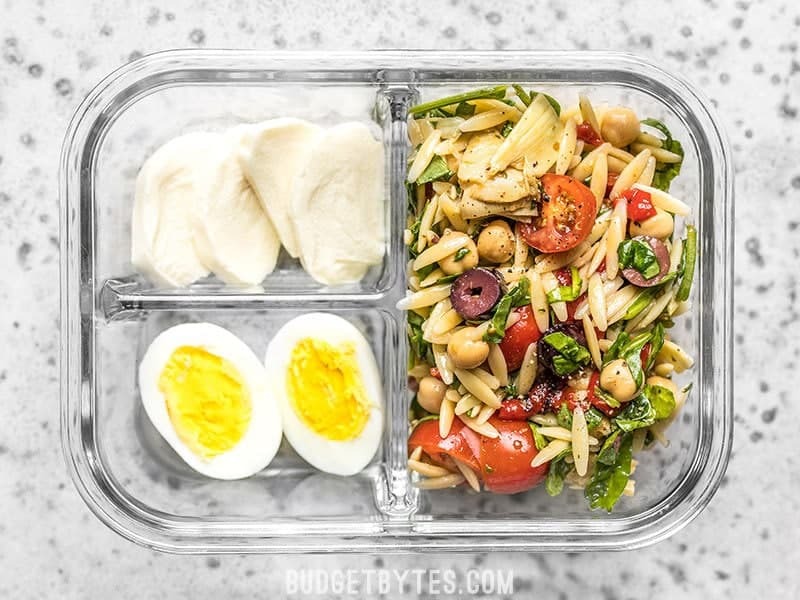 I’m totally going to have to try this for lunch today!